MASON – Novak Djokovic has been one of tennis’ most accomplished players in recent years as has won a title at every ATP Tour 1,000 event except for one. The title that has eluded the world’s No. 1 tennis player is the Western and Southern Open, but after Friday’s performance, the odds of ending his drought in Cincinnati are looking good. Djokovic easily swatted away No. 5 ranked Stan Wawrinka in a 6-4, 6-1 center-court drubbing before a sold-out crowd of over 10,000 at the Lindner Family Tennis Center. The contest was a rematch of June’s French Open final when Wawrinka defeated Djokovic in four sets. Djokovic improved to 18-4 all time versus Wawrinka. 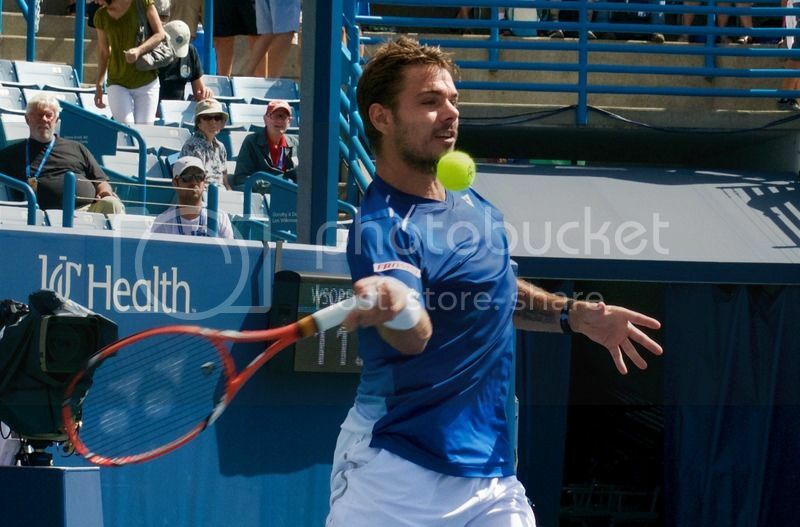 Wawrinka had trouble spotting his first serve in Friday’s match. Against Djokovic, that caused huge problems. Djokovic won 55 percent of the points on Wawrinka’s second serve. Meanwhile, Djokovic was stellar, especially in the middle of Friday’s one hour, three minute match. With Wawrinka leading the first set 4-3, Djokovic polished off the first set by winning the first set, including breaking Wawrinka’s serve at four-all. Djokovic won the first four games of the second set, including a pair of breaks. While Djokovic played well in Friday’s match, Wawrinka said he thinks Djokovic could play even better. Djokovic advances to the semifinals of the Open for the fifth time. He is 4-0 all-time in the semifinals in Mason. His last semifinal appearance was in 2012 when he defeated Juan Martin Del Porto 6-3, 6-2. He then lost to Roger Federer in the finals 6-0, 6-7. If Tomas Berdych was looking ahead to a possible match versus No. 1 ranked Djokovic, it was a big mistake. Qualifier Alexandr Dolgopolov won 6-4, 6-2 in Friday’s quarterfinal, and clipped the sixth-seeded Berdych. Dolgopolov faces Djokovic tomorrow in a David versus Goliath match. Dolgopolov had never won a main draw match at the Western and Southern Open. Djokovic is unbeaten in four semifinal matches at the Open. Dolgopolov becomes the third male qualifier to reach the semifinals, and first to get there in more than two decades. Berdych was kept off balance by Dolgopolov’s serve. Dolgopolov went 22 of 24 on his first serve. Berdych was unable to break Dolgopolov’s serve. Dolgopolov closed out Friday’s match by winning his four final games.